Waiting on Wednesday is hosted by Breaking the Spine. This is my first week participating! More Details on Cindy’s Site! 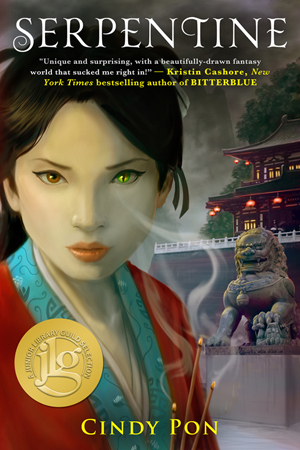 Asian mythology FTW! The Legend of the White Snake is one of my favourite Chinese tales, so I am so happy to see elements of this in the synopsis! I also enjoyed Cindy’s last two Xia books, they brought to mind the ancient Chinese drama I used to watch. Looks like the story will be focused on the magic of ladies-friendship, which is even better as I am getting jaded by all the romance in books I’ve read recently. If you preorder through Mysterious Galaxy, you can also get your own copy of Cindy’s Chinese brush painting art. I remember being sent a painting of a lotus when I preordered Silver Phoenix. Yes this one sounds very good. The cover reminds me a bit of the disney cartoon Mulan though, but Cindy Pon writes some great books. Hi Aimee, thanks for commenting! Yes! My heart does a twirl whenever I see an Asian protagonist. Hope this will pave way for more books like it! Don’t we just LOVE IT when books about or are based off other cultured are published/highlighted in a book? I am not familiar with the tale, but the fact that it is something that I don’t know excites me a lot. I would love to love this book and learn from it! It looks interesting. I hope you enjoy it. Thanks for sharing. Hey Danica, thanks for commenting and for the links! Wow, great find! I definitely need to check out Cindy Pon’s books because they seem right up my alley! Hi Aylee! Thanks for commenting. I’ve not heard of this one until now but it sounds pretty excellent. Hi downrightdystopian, thanks for commenting. I enjoyed The Silver Phoenix by Cindy Pon (food descriptions in that story made me hungry, ha, but I liked the dreamy fantasy feel.) I’m also looking forward to Serpentine. I am very excited for this book as well! It looks incredible! Yes, I’m all for diversity in my YA :D!